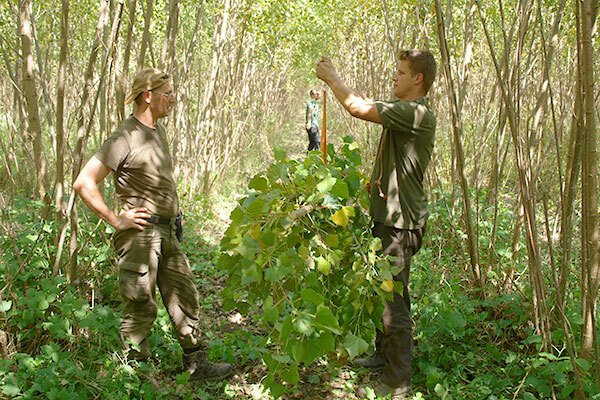 Dendromass4Euope (D4EU) aims to implement a dedicated monitoring and applied-level research to ensure quality and production stability of poplar short rotation coppices (SRC). This includes measurement of the growth performance of trees, which can be affected by species, age, rotation, stand density, site quality and water conditions. For that purpose, our Hungarian partner Ökoforestino will collect lots of data. For instance, they are measuring the tree height and diameter at breast height of at least 200 sample trees per field or shoots, or the fresh weight of 15 representative trees inside of a trial plot. Based on the results, biomass functions will be modelled and applicated to all individuals of the trial plot. This provides information about how the SRC will grow over the next years. The picture shows two fellows of Ökoforestino, measuring the fresh weight of a young poplar. SRC provide extraordinary fast growth and excellent opportunities to control the wood quality and quantity due to the use of elite clones. In a hot summer like this year, the crowns provide a perfect shelter for smaller plants and animals living in the SRC. This not only keeps it much cooler inside of SRC. It also helps improving the soil characteristics because of a higher humidity and a better siol biota. After harvesting, SRC crowns and branch wood can be utilized as a source of energy or for producing bio-fertilizers supporting circular economy by means of nutrient cycling. Next Post Next Post: New press release out now!